BendFilm opens its ninth annual run in downtown Bend tonight. And I personally am halfway through my ninth year as a citizen of Bend. Coincidence? Yeah, probably. But the international festival of independent film has enmeshed me in its web — first as a magazine editor that emblazoned its cover with the first festival, later as a volunteer member of the selections committee. For the past four years, I have been a member, albeit a quiet one, of BendFilm’s board of directors. Memories? I have many of them, starting with festival founder Katie Merritt. She built a successful event from scratch, showing amazing creativity, skill and pure moxie in shaping what has become an institution not only in Central Oregon but also among aspiring Hollywood filmmakers. Perhaps my favorite movie ever screened here was “Born into Brothels,” which subsequently won the Academy Award as best documentary of 2004. But I recall many more, such as “9” (2005), a UCLA animated student short that Tim Burton turned into a full-length movie; “Outsourced” (2007), which later became a popular television series; and “Den Osynlige (The Invisible)” (2004), a supernatural Swedish thriller that was remade into an American feature, “The Invisible” (2007). This year, the roster of foreign-produced films extends well beyond neighboring Canada. Germany, Denmark, Ireland and Poland all have entries, along with Thailand, Brazil, Tunisia and South Korea. That’s five continents’ worth, in case you weren’t counting. But the movies to which I’m really looking forward are two documentaries — “Ethel,” which opens the festival program with a 5 p.m. showing today at the Tower, and “The Revolutionary,” to be presented at 2 p.m. Friday at McMenamins and at 10 a.m. Saturday at the Oxford Hotel. 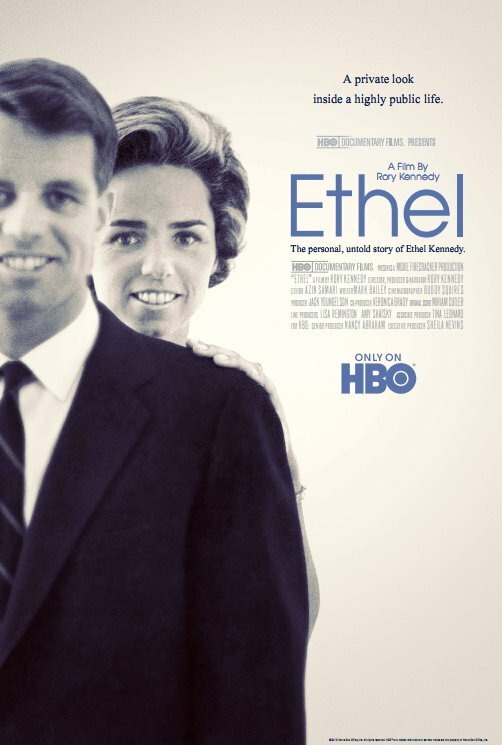 “Ethel” is a full-length documentary biopic of the life of Ethel Kennedy, the widow of Robert Kennedy, as directed by their daughter, filmmaker Rory Kennedy. “The Revolutionary” tells the story of Sidney Rittenberg, an American who invested 35 years of his life in Maoist China. Go online to www.bendfilm.org for complete festival information, or drop by the festival office at downtown Bend’s Liberty Theatre, just north of the Tower Theatre on Wall Street. 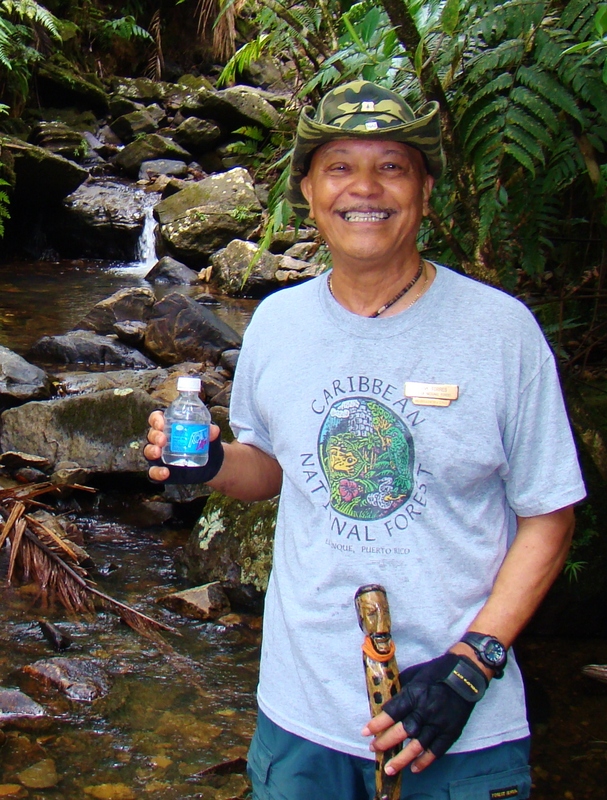 “There is more biodiversity in this forest than anywhere on the entire North American continent,” said Frank Torres, a ranger for El Yunque National Forest in Puerto Rico. After joining Torres on a walk through the only tropical rainforest in the national forest system — covering 29,000 acres in the eastern highlands of this Caribbean territory, between 2,000 and 3,500 feet elevation — I can imagine how that might be the case. The annual rainfall here averages more than 200 inches, substantially more than Washington’s soggy Olympic Peninsula. It occasionally exceeds 300 inches, most of it between June and November. 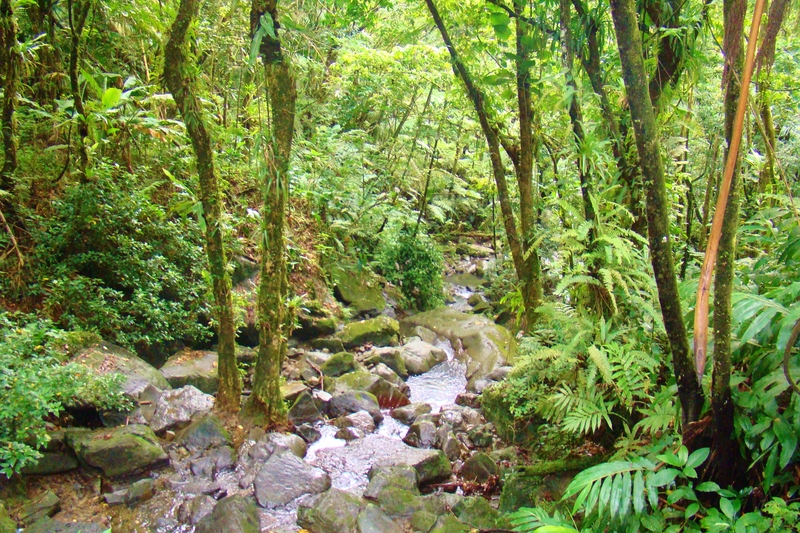 In all, there are 240 native Puerto Rican trees in this conservationist’s dream, 23 of them found only in El Yunque. Some 150 types of ferns, and 50 native bromeliad orchids, take root in many of these trees and in the rich soil beneath them. 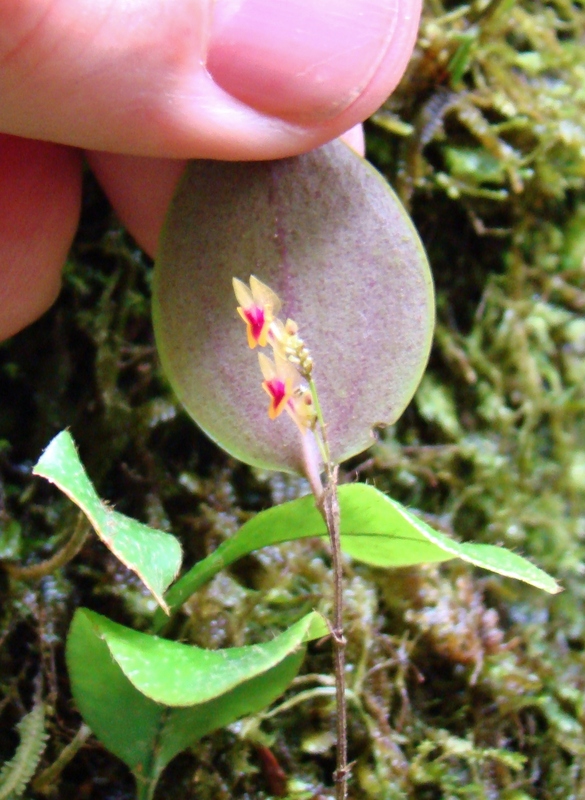 Among them is the Lepanthes woodburyana, the world’s tiniest orchid. Rare vines cling to bark and drape from branches. Leathery “elephant ear” leaves, three feet across, lay rotting on the forest floor. Coral hibiscus, yellow heliconia and bright red bottlebrush add color. 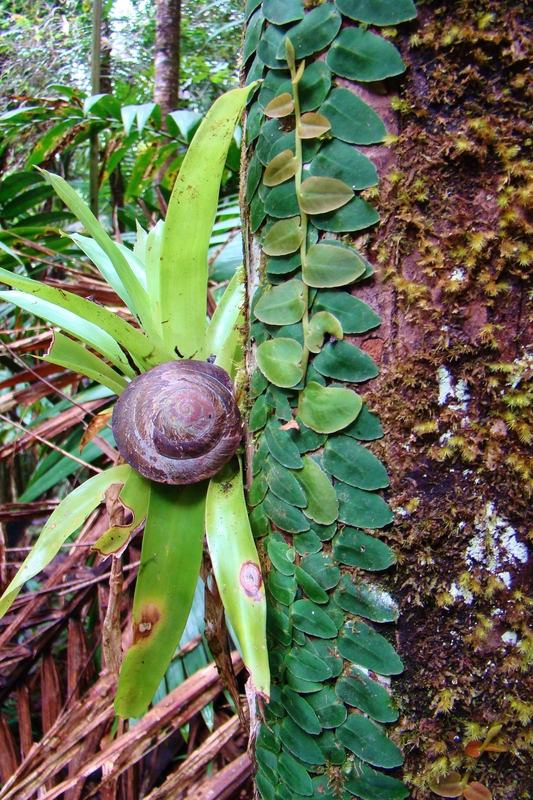 Biodiversity: A snail clings to a bromeliad on a vine- and moss-covered sierra palm. Torres, an Air Force veteran of Desert Storm, has worked in the forest for 17 years. He took me on a hike through an area where the movie “Predator” was once filmed, pointing out the ruins of buildings left by the Civilian Conservation Corps when it built roads and trails — as well as its own public swimming facility and trout hatchery — in the 1930s. Puerto Ricans no longer swim here. In fact, no vehicles are permitted on the trails, not even mountain bikes. The trails are for foot traffic only. “El yunque,” Torres told me, refers to “the land of white clouds” in the language of the long-departed aboriginal Taino people. It was regarded, he said, as the place where the earth touches the sky. There are no carnivores in this forest, save its 11 species of bats, who feast on mosquitoes and other insects — along with singing tree frogs (“coquis”), lizards and dozens of birds. I had hoped to see the island’s legendary parrot, but “that would be like winning the lottery,” Torres said. Only about 60 of these magnificent green birds survive in the forest today, he said — but that is up from 13 counted in 1975, when the U.S. Forest Service began a preservation program. In addition to the forest’s wild parrots, Torres said, about 300 more are being bred in private aviaries, and are scheduled for eventual release. I began and ended my tour of El Yunque from El Conquistador Resort (www.elconresort.com), where I am staying. This vast resort, situated atop a bluff at the northeastern corner of Puerto Rico, is at once old-school and classic, with more than 900 rooms and 11 restaurants. Rainforest tours begin daily at 9 a.m., returning to the hotel by 1. Many Americans have not heard of the massive mudslide that took place July 12, a week ago, in southeastern British Columbia. Triggered by heavy rains, a piece of mountain broke from the alpine heights of the Purcell Wilderness. It slid down to the northeastern shore of Kootenay Lake, burying much of the remote hamlet of Johnson’s Landing and taking four lives in the process. Three of the victims were from the same family — two young Florida women, ages 22 and 17, who were spending their summer on the lake with their divorced father. 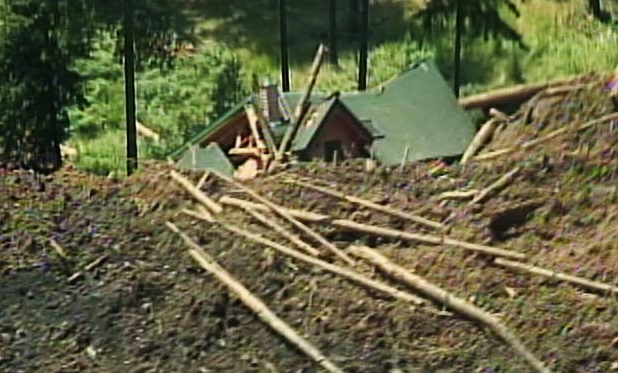 Their house was crushed and buried. My good friend Randy Morse, an author, musician, artist and entrepreneur whom I’ve known since we tolerated the same high-school classes, lives on the opposite shore of Kootenay Lake, in the small town of Kaslo at the foot of the Selkirk Mountains. While the 1,000 citizens of Kaslo are doing what they can to assist their neighbors, Randy said, there are only so many dollars to go around. He’s not normally one to do so, but he is asking friends to contribute to a Canadian Red Cross relief fund at www.redcross.ca/severeweather. I will be at Morse’s home on Kootenay Lake, north of Nelson, for several days beginning August 7. If you know me personally, I’ll be glad to deliver relief donations and bring home your mp3 recording. About this time last week, I was wrestling an alligator in Florida. Okay, so he (she?) was only about two feet long, and his (her?) snout had been taped shut with electrical tape by a handler. 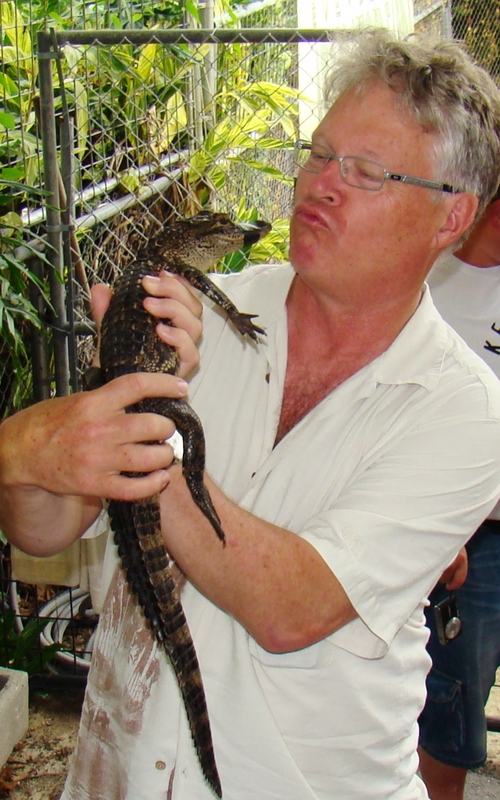 And I wasn’t exactly wrestling the beast, so much as trying to kiss it. But it was still an alligator. And while this test of strength and wits took place at the Everglades Alligator Farm — and this young gator may be destined to someday become a high-fashion bag or a pair of cowboy boots — it served the purpose of getting me up close and personal with North America’s largest reptile. 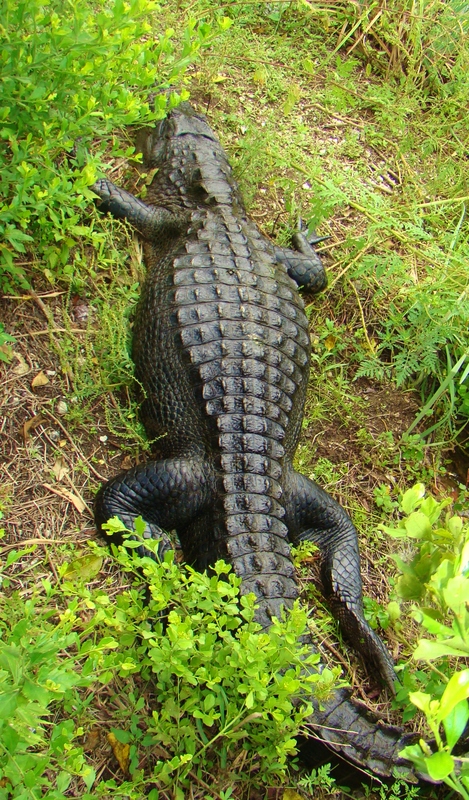 Certainly, I wasn’t going to duplicate the stunt in nearby Everglades National Park (www.nps.gov/ever). 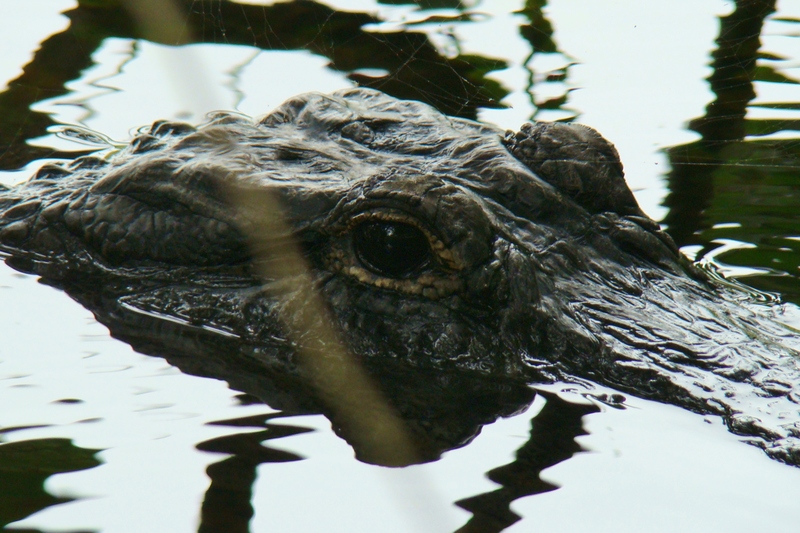 With an estimated 200,000 wild alligators in the park (out of about 1.5 million throughout Florida), the unique “sea of grass” known as the Everglades has been a conservation success story … thanks in part to alligator farming. 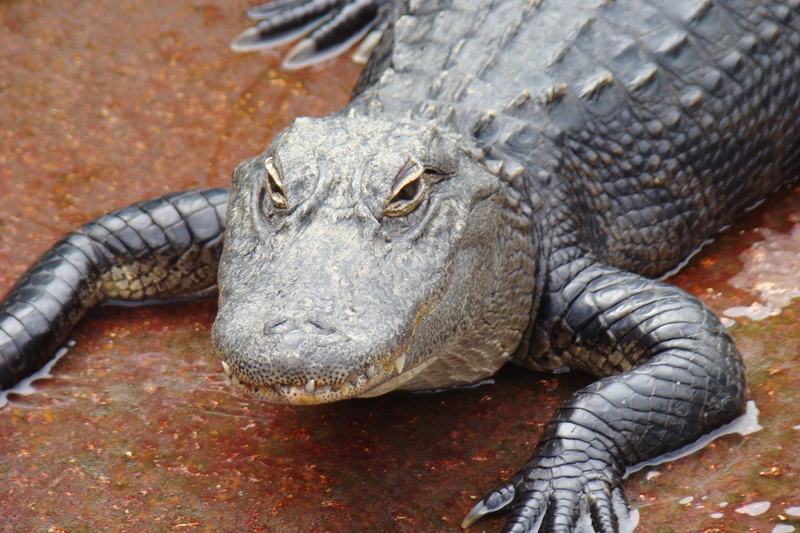 As recently as the 1950s, the American alligator was threatened with extinction. The prehistoric reptile was being heavily poached to satisfy a demand for high-fashion items, including shoes, belts and purses. I saw about a dozen wild Everglades gators while walking the Anhinga Trail, near a national-park visitor center west of Homestead. This half-mile boardwalk crosses a seasonal swamp; a park ranger assured me that the reptiles’ numbers would greatly increase by the arid season in mid-winter, when many other sources of water had dried up. On this day, the animals mostly lay quietly in the water-side grasses beneath the boardwalk, or partially submerged in the shallow water. But I didn’t have any fantasies about reaching out to stroke their thick, dark hides. Granted, they can only see sideways — not directly in front of them, and certainly not behind — but 80 teeth are nothing to mess around with. Back at the Everglades Alligator Farm (www.everglades.com), I enjoyed the Disney-like stage show and feeding exhibition, explored the pens filled with baby gators and looked over the alligator breeding pond. But I was most impressed with an airboat ride. 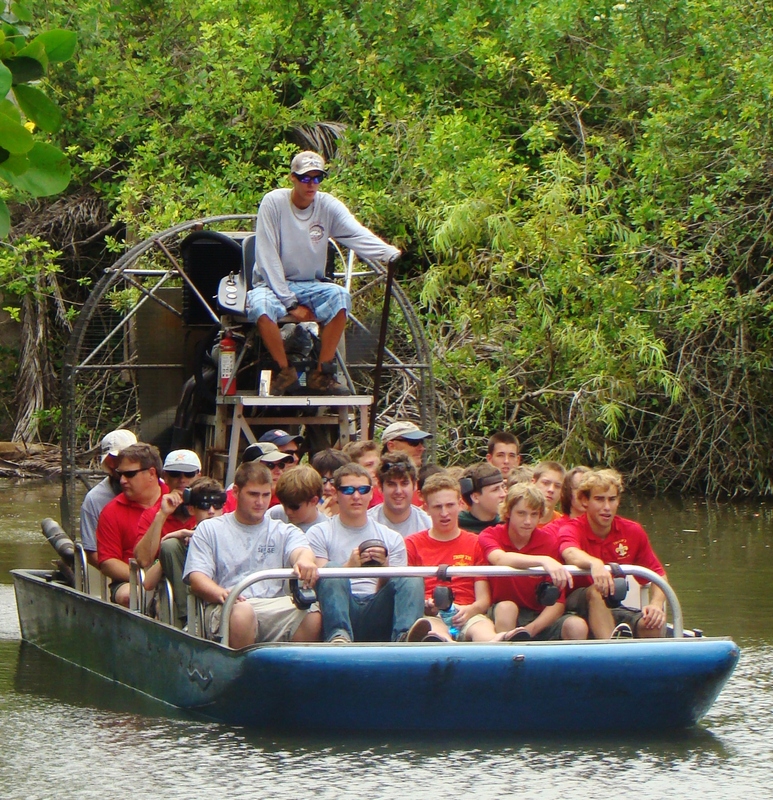 Loud and wet, these flat-bottomed boats carry as many as 30 visitors on a two-mile tour of the swamp next to the farm. They are propelled forward by a column of air that enables them to ride above a seemingly infinite expanse of sawgrass, even with little or no water beneath. Rare panthers live in this ecosystem, although I saw none. But I did see numerous wildflowers found nowhere else on earth. 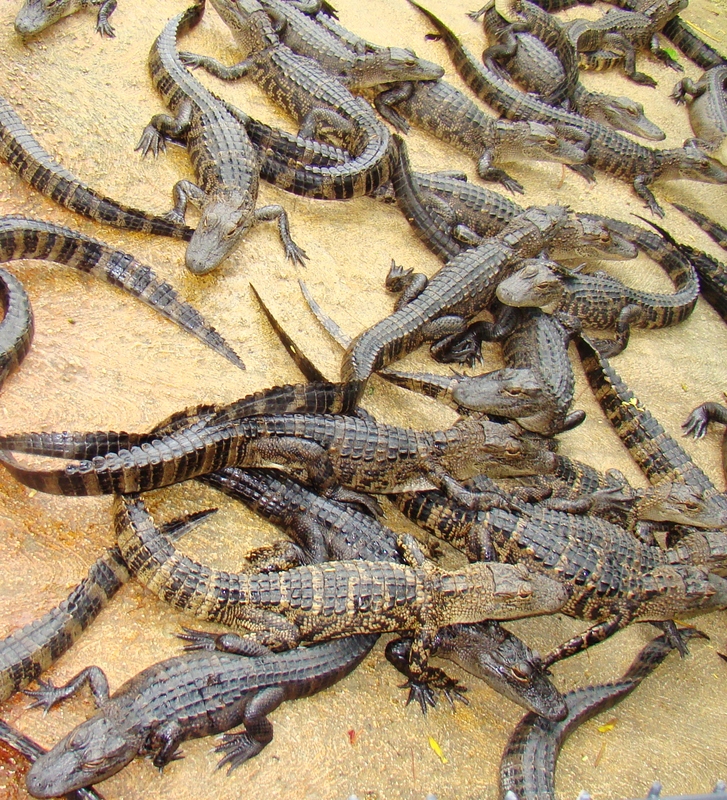 And I saw several more wild gators. I won’t be wrestling any of them. See you later, alligator. Lots of Gold’s Gym-advertisement girls and boys strutting down Ocean Avenue in bikinis and Speedos. Grand, palm-fringed mansions in Coral Gables, Coconut Grove and manmade Star Island, in Biscayne Bay. A celebratory parade for the Miami Heat, champions of pro basketball. 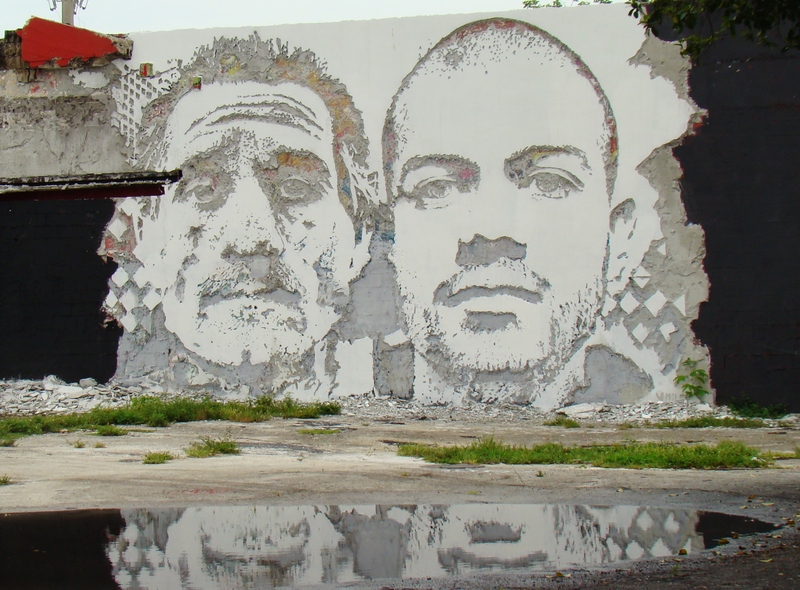 What I did not expect to see was the way masterful graffiti art has taken over two square miles of the Wynwood Arts District and Miami Design District in north Miami, much to the delight of local merchants. This area has become, in effect, the world’s largest open-air, street-level museum. “It’s been legal graffiti since 2006,” explained Marcos Valella, a celebrated local oil painter who supplements his income by working as a tour guide. “A group called ‘Primary Flight’ positioned itself as the middle man between property owners and graffiti artists during Art Basel,” he said. A European-born arts celebration, Art Basel has become one of the most prestigious in the Americas since it was established in Miami in 2002. Northwest 2nd Avenue, especially between 22nd and 29th Streets, is the heart of the district, whose merchants include dozens of permanent galleries, as well as design shops and restaurants. “Paint manufacturers have even begun making special spray paint specifically for graffiti artists,” Valella said, as he indicated one wall sponsored by the Ironlak company. 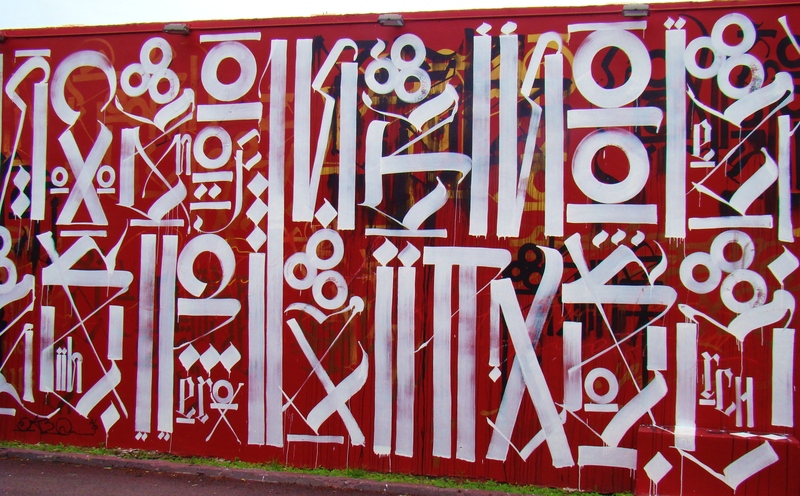 The names of “famous” graffiti artists rolled off the tongue of my artist-guide: Shepard Fairey, Ron English, Kobra, Buff Monster and Ahol Sniffs Glue, to name a few. 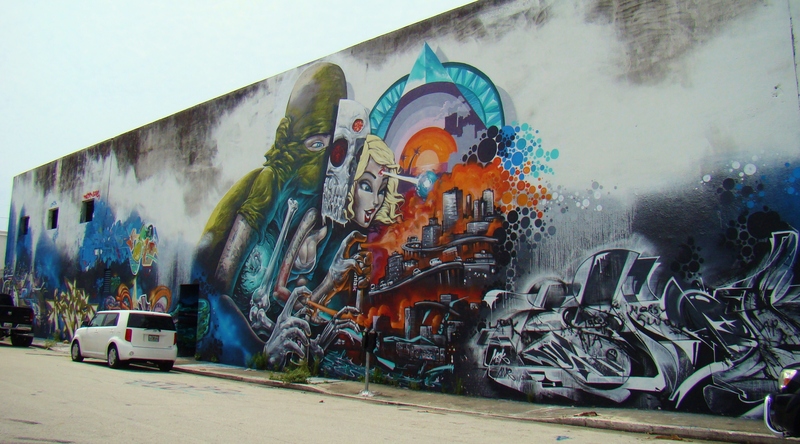 These are just a few photographs from the Wynwood district. American Airlines has begun direct, nonstop service between Seattle and Miami. Flights, which depart at 9:25 p.m. daily and arrive at 6:15 the following morning, take fewer than six hours to travel from the northwesternmost corner of the continental United States to the southeasternmost. The ever-flamboyant Storm Large may be the headliner for Friday night’s Hullabaloo at NorthWest Crossing, but don’t sell 3 Leg Torso short. My guess is that you may never have heard anything like this eclectic Portland band. There may in fact be no words to accurately describe this instrumental music. Said violinist and co-founder Béla Balogh: “When we started, we didn’t put any parameters on what we’d play.” That holds true today. The band today: Von Drehle is in yellow, Balogh looks through the window. Balogh and Von Drehle met in 1993 at a music store where Balogh worked, and soon wound up playing in a rock band together. But they discovered their musical passions lay elsewhere. 3 Leg Torso was born in 1996 as a trio, including a cello; later, drums and bass were added. Today the band includes standup bass player Mike Murphy and percussionists T.J. Arco and Gary Irvine. Collaborations with symphony orchestras have inspired a new passion of writing for larger ensembles, Balogh said. 3 Leg Torso has even performed with his father, Hungarian-born Lajos Balogh, a longtime symphony conductor at Portland’s Marylhurst University. 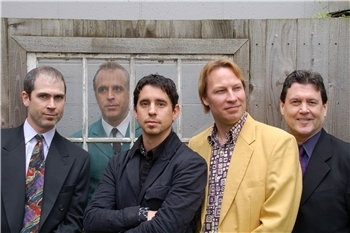 The band has produced three independent albums — most recently “Animals & Cannibals” in 2010. Despite its roots, it has at times been loosely compared to Argentine nuevo-tango originator Ástor Piazzolla and to the Kronos Quartet modern chamber ensemble. You can watch the band perform on its web site — www.3legtorso.com — or, better yet, live and free tomorrow night in Bend. 3 Leg Torso takes the stage at the NorthWest Crossing Neighborhood Center at 7 p.m., preceding Storm Large and following local Celtic-influenced favorite Five Pint Mary. 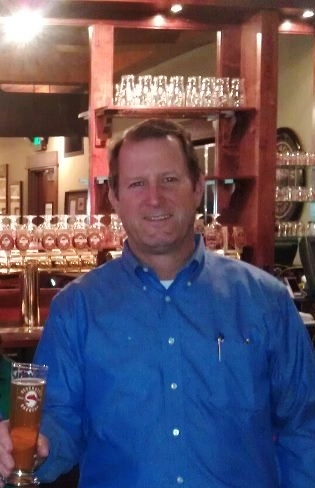 An unusual beer-tasting dinner Friday night at Bend’s new Deschutes Brewery Public House introduced me to a whole new world. It wasn’t so much the food prepared by Jeff Usinowicz, the founding chef of Deschutes’ Portland pub, although his pinot barrel-planked wild salmon and cocoa-braised ox tail were truly outstanding. It was more about the beers: specifically, the uniquely crafted, small-batch beers that Deschutes (www.deschutesbrewery.com) and the tiny Hair of the Dog Brewery (www.hairofthedog.com) blended into a collaboration beer they call Collage. 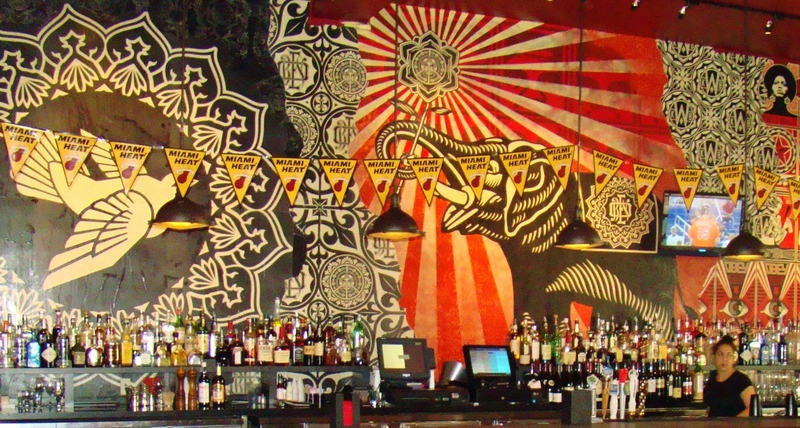 If you’ve never heard of Hair of the Dog, don’t feel like you’re out of the loop. 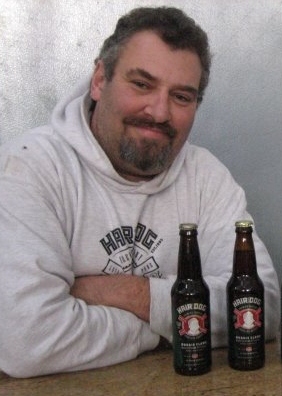 Although the brewery in Portland’s Inner Southeast has been around since 1995, founder Alan Sprints has kept his annual production down to just 15,000 barrels of its one-of-a-kind brews. Compare that to Deschutes’ 220,000 barrels a year. The Dissident, a Flanders-style red ale with cherry overtones, and Adam, a Dortmund-style brew with chocolate insinuations, were aged in oak barrels that had formerly held Oregon pinot noir. The Stoic was aged in a rye whiskey barrel, while Fred, made with rye malt and a suggestion of coffee, was aged in a bourbon whiskey barrel. At the Bend dinner, 80 guests were able to individually taste each of the four component beers before sampling the masterpiece. Assisted by Deschutes’ Bend chef, Katrina Spatrisano, Usinowicz prepared a six-course dinner, each course paired with a different brew. The Dissident was a perfect match for the smoked Penn Cove mussels that accompanied poached Dungeness crab legs, served with baby greens. The rye-flavored Stoic was great with the salmon course, served with shiitake mushrooms on gnocchi splashed with brown butter. Fred’s bourbon accent added a rich flavor to Usinowicz’ self-described “pork and beans” — flageolet beans and bacon-wrapped boar sausage topped with hibiscus-rubbed duck confit. Shredded ox tail, braised in cocoa for eight hours and served with a morel mushroom flan, was a marvelous match for Adam’s chocolate edge. Surprisingly, the weakest course was the last before dessert: smoked rib-eye steak with cured lamb bacon, truffled potatoes and arugula salad. But it may have been overshadowed by its pairing with Collage. 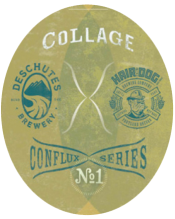 The first of Deschutes’ new “Conflux Series” — No. 2 actually came out in 2011, a White IPA made together with Boulevard Brewing of Kansas City — Collage indeed inherits flavors from each component. Deep caramel in color, it is at once tart and lightly fruity, with its rye and bourbon traits becoming more evident as the beer warms up a bit. Collage is available at Deschutes brewpubs in very limited quantities, in 12-ounce bottles priced at $12 apiece with a three-bottle limit. A taster tray of the four blends and the final Collage (at 11.6% alcohol, a strong ale indeed) is being offered for $20. In case you were wondering, dessert on Friday night was an Obsidian Stout chocolate cake with toffee gelato. It went as well with Collage and it did with Deschutes’ 12-year-old Jubel 2000 ale.